The competition in the global fire protection system is expected to heat up in the coming years, notes Transparency Market Research (TMR). This is mainly because of high demand from end user industries. Key players in the global fire protection system are focusing on mergers and acquisitions in order to strengthen their hold on the global fire protection systems market. Apart from this, top players are increasing their product quality via research and development activities. This is expected to help them retain their loyal customers. Some of the key players operating in the global fire protection systems market are Fike Corporation, Consilium AB Publ., Emerson Electric Co., Gielle Srl, Danfoss Semco A/S, Drägerwerk AG & Co. KGaA, KEVTA Fire Systems, Inc., Johnson Controls plc, Blaze Manufacturing Solutions Ltd., and Honeywell International, Inc. According to a research report by TMR, the global fire protection systems market stood at US$5.08 bn in the year 2014. The analysts predicted the market to attain a valuation of US$8.93 bn by the end of 2023. During the forecast period, the global fire protection systems market is estimated to grow at an impressive 6.48% CAGR. Based on geography, North America is anticipated to account for a large market share in the forecast period. This is mainly because of tremendous rise in the oil and gas industry and growing demand from countries like U.S. and Canada in the region. On the basis of offshore platforms, fire suppression systems is likely to lead the global fire protection systems market in the coming years. 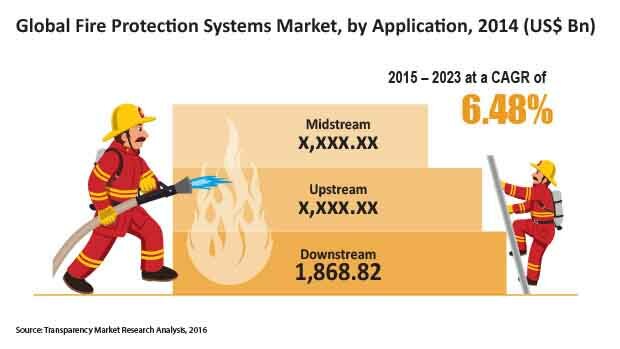 The global fire protection systems market is projected to expand on the back of rising demand for fire detection equipment and fire suppression systems in the lucrative oil and gas industry. Apart from this, the burgeoning construction industry in several parts of the world is attributed to fuel the global fire security system in near future. With new development plans and projects, the use of construction equipment is expected to grow. The installation of fire protection systems in buildings has become common. This is because fire protection system helps in effective detection, and extenuation of fires. Currently, advanced technologies have been developed for carrying out communication during fire situations. This enables quick deployment of response teams to the affected site. This results in high acceptance of the fire protection system. Along with this, increase in fire regimes, stringent government laws, increasing consumer awareness, and rising investment are some other factors which are projected to drive the global fire protection systems market in the coming years. Despite several drivers the fire protection systems market is likely to suffer due to the few factors. Some of them are unexpected fire alarm systems failure, high cost of installation, high maintenance cost, and hefty costs involved in replacing traditional fire detectors. Fire system maintenance includes timely auditing of fire protection systems. This helps to ensure fire protection system meets all required fire safety standards and detects their functioning at the time of emergency. However, growing demand from the oil and gas industry could help the global fire protection systems market gain impetus due to increasing number of installations in onshore drilling and offshore oil rigs.